As you can see from the below. 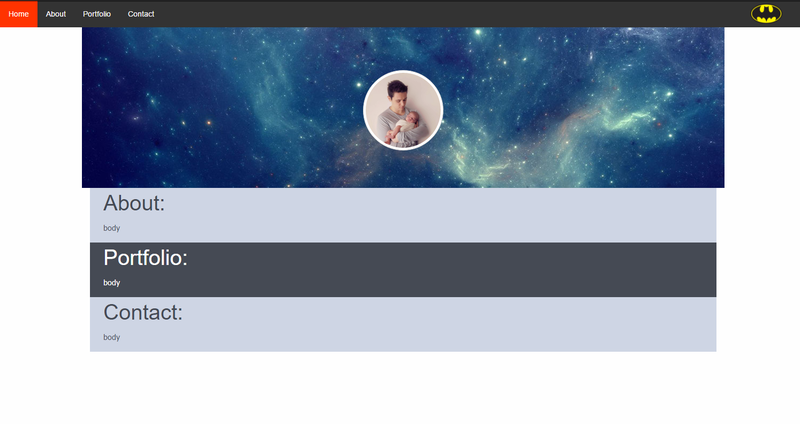 I can’t figure out how the get the image on my banner (background-image) to line up correctly with my main body. What am I doing wrong? P.s. please be kind, I have only been doing this for a couple of days. You may wish to revisit the dimensions for #banner. The closest I have got so far is that if I add “margin-left: 15px;” to the CSS for “#banner” - it resolves the alignment in full screen. But then as I move towards mobile view the margin pushes the banner off again. I have made further progress as you can see in the link below by shrinking the width and using margin-left: Xpx. This seems to line it up on full-screen mode but when I shrink the screen the margin pushes it off to the right. Working with your original code, what about changing the container classes in your sections with the row class. You may have to also remove the margin-left in the banner id.